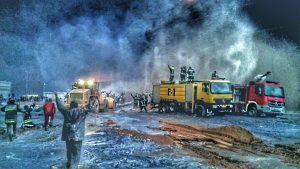 The National Oil Corporation (NOC) has praised its firemen who brought a dangerous oilfield blaze under control after a day-long battle. The fire is understood to have broken out in metering equipment in the Sirte basin’s Ghani field operated by Harouge Oil. NOC did not explain when the incident too place, its cause nor the full extent of the fire and damage. The January 2016 fires in the tanks farms at the Ras Lanuf and Sidra oil export terminals had both been caused by terrorists attacks. However, it was full of praise for firefighting teams from Harouge Oil and two of other NOC subsidiaries, Mabruk and Sirte. It said that operating in difficult circumstances, compounded by local insecurity, the firemen had brought the blaze under control is less than 24 hours, which NOC was was record time for such an incident. The state oil company added that no production had been lost because the Ghani field, which in 2012 with the EdDib and surrounding fields, had an output of 74,000 bpd, is currently shut in.